Arsenal and Tottenham Hotspur have been fined £45,000 and £50,000 respectively for failing to control their players in the north London derby on 2 December. Both clubs admitted the Football Association charge. A melee broke out after Eric Dier’s equaliser at 1-1 in the Premier League game, which Arsenal went on to win 4-2. Dier put his finger to his mouth after scoring at Emirates Stadium and celebrating Spurs players then clashed with the home side’s substitutes. The FA’s report said Dier’s celebration was “provocative” and was “likely to incite the crowd in a match of this nature and was ill-advised”, despite the England international’s statement that he had been “the subject of abuse by Arsenal fans”. It also said there was “no excuse” for Arsenal substitute Stephan Lichtsteiner to step on to the pitch at Emirates Stadium to touch Dier once the Spurs players started celebrating near where the Gunners’ replacements were warming up. 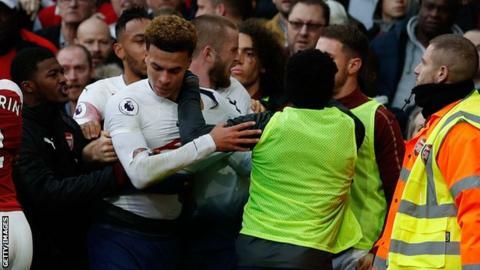 However, it added that Lichtsteiner’s actions “did not warrant” the reaction from the Tottenham players and especially Moussa Sissoko, who pushed Lichsteiner away, while also noting that Arsenal midfielders Aaron Ramsey and Matteo Guendouzi “acted aggressively” in the melee. The independent regulatory commission concluded that both clubs were “were equally to blame for the events that occurred”. Spurs had four previous breaches in the past five years but none since September 2017, while Arsenal had two but the last was in May this year. As a result, Spurs were initially fined £70,000 and Arsenal £60,000, reduced to £50,000 and £45,000 respectively for admitting the charge. The report also noted that a “number of plastic bottles” were thrown by spectators in the vicinity of the melee. Tottenham’s Dele Alli was struck by a plastic bottle during his side’s 2-0 Carabao Cup quarter-final victory at Arsenal on Wednesday. Arsenal say they have identified an image of the person who threw a bottle and police are investigating the incident.